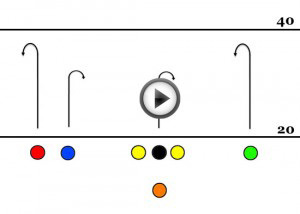 Quarterback Progression: On this flag football play, there’s really not a set progression. The quarterback should try to determine pre snap based on what the defense is set in. Against a Cover 2 – the Blue receiver will probably be the main target. Usually the cornerback will line up in between Red and Blue. The linebacker will cover the center. As Blue hooks inward the ball should be thrown. Visit the playbook page to get more details on downloading the full playbook.